Where Henry Butcher came from is not obvious – there are a large number of people of that name in the 1911 census. What is clear is that he married Mabel Lilian Gander in the September quarter of 1916 in Woolwich district. As he was apparently born in 1889 (age 56 when he died in 1945), he may well have served in the First World War and married while on leave, although no service papers or medals have yet been found. Throughout the 1930s Henry and Mabel were living in Footscray Road, Footscray, near Bromley, Kent, originally at No 147, later No 131. Harry appears to have done well; a company secretary on Kenneth‘s probate papers in 1944, and lived in Westhumble in the substantial house called “Friston” during the war, although that could have been rented to escape the German bombing runs over Kent. “Friston” is on the eastern side of Pilgrims Close: it is fascinating to locals to see the western side not built up in this picture taken outside “Friston”. 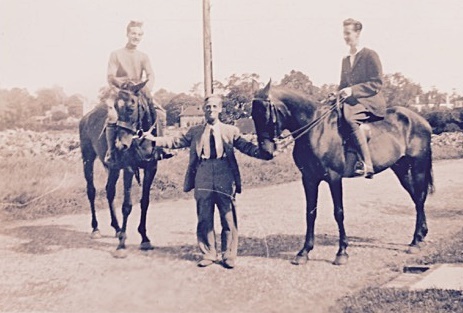 It shows Harry Butcher holding the heads of the horses ridden by two of his sons Ken and Alan. Harry did not survive his son Kenneth for long. He died in Dorking General Hospital a mere fourteen months later, on 2nd March 1945, His executors were his widow Mabel and his married daughter Joan Eaves. He was buried in St Barnabas churchyard on 7th March. (Interestingly, the next entry in the register, five days later, was the burial of Maud Mariamne, Lady Ashcombe, of Denbies House.) Unsurprisingly, Harry was buried alongside his eldest son Kenneth (grave K 19). 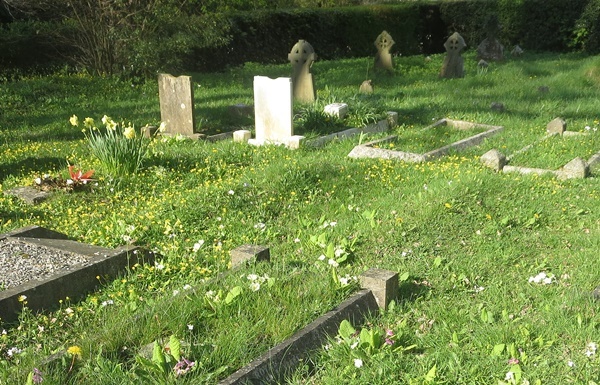 Seen across the wildflower-strewn churchyard of St Barnabas, Henry and Kenneth’s graves are the two nearest headstones. Ken’s is the white one to the right, tended as an official war grave every year by the Commonwealth War Graves Commission. Ken’s mother was born in late 1897 at Chislehurst, Kent, daughter of Henry and Emma Gander, A general labourer in the 1901 census, Henry Gander was born in Ditchling, Sussex about 1857, Emma in Stepney, London about 1868. The family were living in No 3 Slades Cottages, Green Lane, Chislehurst, their four children all born at Chislehurst. The eldest son Henry J. aged 14 was a bar-boy, in some business to do with mineral water. There were three younger sisters: Emma C aged 6, Mabel herself, 3, and Edith M, 1. With the considerable age gap between Henry junior and Emma junior, one wonders if their father had a previous wife (Henry junior’s mother) who subsequently died. The 1911 census appears to bear this out. Henry junior is not at home: he would have been 24, but Henry senior and Emma say they have been married only 19 years, with three children living and none dead. The three girls are still at home, but by now the family have moved to 6 Theobalds Cottages, Southwood Road, New Eltham, Kent, and Henry the father has his own business as a greengrocer. In the September quarter of 1916 Mabel Lilian Gander married “Harry” Butcher in Woolwich district. For many years during the 1930s the couple lived at Footscray, Kent, until they moved to Westhumble during World War 2. After she lost her eldest son Kenneth in 1944 and her husband the following year, it is not certain where Mabel lived, but thirty-five years later, on 5th July, 1979, she died in East Grinstead, at Halsford Park Road. She was brought back to Ranmore to be buried with her husband and alongside their son in St Barnabas churchyard (ref K 19). The four Butcher children were: Joan Leslie (1917), Kenneth Henry (1919), Donald J. (1921) and Alan G. (1926). The eldest Butcher child and only daughter, Joan was born towards the end of 1917 in Lewisham district. In the 1939 electoral register, having just reached voting age, she is recorded as living with her parents (and, no doubt, with most, if not all, of her younger siblings) at 131 Footscray Road, Footscray, Kent. Five years later, the same year as her brother Kenneth was killed in an accident, she married Samuel Clifford Eaves in Surrey South-eastern district. (He may be the Samuel C Eaves born 1919 in Crickhowell, Wales.) Joan and Samuel Eaves had two children, a daughter in 1948 and a son in 1951, the former registered in Surrey, the latter at Worthing. In the 1945 electoral register Joan is with her parents at “Friston”, Pilgrims Close, Westhumble: perhaps Samuel is with the forces, or she was there because her father is ill. When her father died that same year, Joan and her mother were executors of his will. Joan herself died in 2011. Ken comes next in the family order, born December quarter 1919 in Lewisham district. He was a Corporal in RAFVR during World War 2, and died as a result of an accident in January 1944 aged 24. For more details see his page. 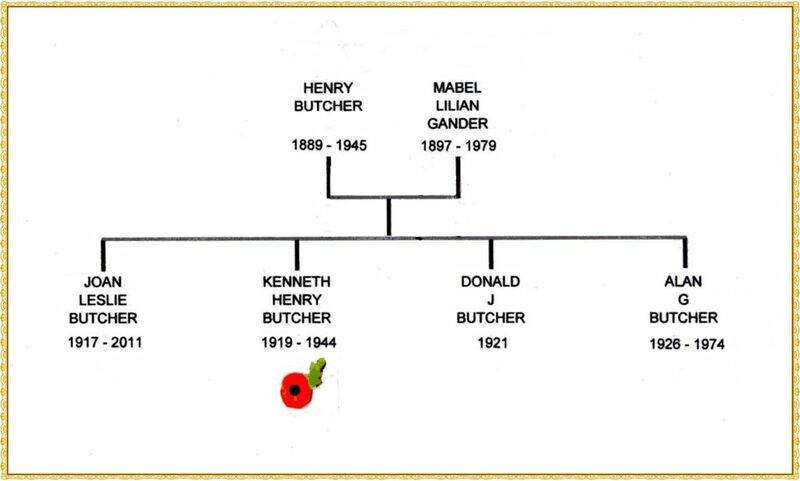 The second Butcher son and third child, Donald was born in Bromley district in the June quarter of 1921. 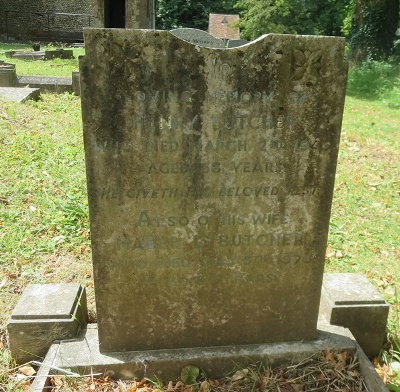 No doubt he lived for some time with the rest of the family in Footscray Road, Footscay, Kent; whether he went with them to Westhumble is not known. In World War 2 he was a Flying Officer in the Royal Air Force. He was captured and, at the time of Kenneth’s death in 1944, was being held in a prisoner-of-war camp from which he later escaped. Donald married and had children. He lived a long life, in Leatherhead, Surrey (a few miles north of Westhumble) for some of the time, and was still alive in 2015. 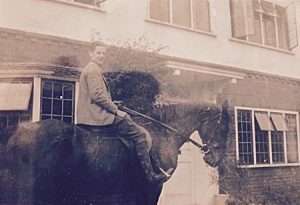 This family photograph is captioned “Alan outside “Friston” , the house in Pilgrims Close, Westhumble. Alan, the youngest child, was born 22nd June 1926 in Bromley district, and no doubt lived in the family home at Footscray, and probably at Westhumble. During World War 2 he was in the army and, about the time of his brother Kenneth’s death, was taken seriously ill. So grave was his illness that his parents were summoned to his bedside at his army base in Yorkshire. Fortunately he recovered. In December quarter 1947 he married Fay Poynter In Southwark. Alan and Fay seem to have had three daughters, including twins. With the Leatherhead connection of his brother Donald, he is probably the 24-year-old “Alan G. Butcher of Flat 1, Hawks Hill House, Leatherhead” on an “Incoming Passenger List” of the Cunard White Star liner “Queen Elizabeth” which arrived at Southampton from New York on 14th November 1950. Perhaps a business trip: his occupation was company director and he appears to have departed for New York on the same ship the previous 17th October. Alan Butcher died in Southwark in 1974. This is a composite list of the sources consulted for all members of Kenneth Butcher’s family, but details for the individual family members are available if required. Virtually all of the sources mentioned can be viewed online via Ancestry, Find My Past and Free BMD.